I'd be all happy too if I could go on vacation for a month. Not that they were kicking back on a tropical island; they probably did important Dessert Truck work like have dessert experiments, and find good corners for me to walk to so I could eat their desserts. And stuff. 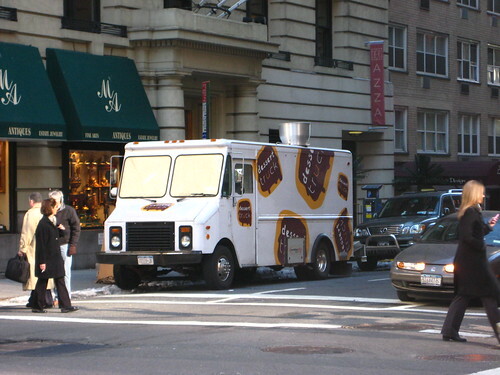 This week the Dessert Truck ended their winter break, and showed some love to east Midtown by parking on 55th Street and Lexington Avenue. I didn't get a chance to eat any of their desserts prior to the holidays so a few menu items might be new to me, but old to everyone else. The items in question are "Warm Slow Baked Apples" and "Passion Fruit Ganache Macaroons." I also noticed that what I believe are the Bomboloni have now been transformed into "Warm Brioche Doughnuts." 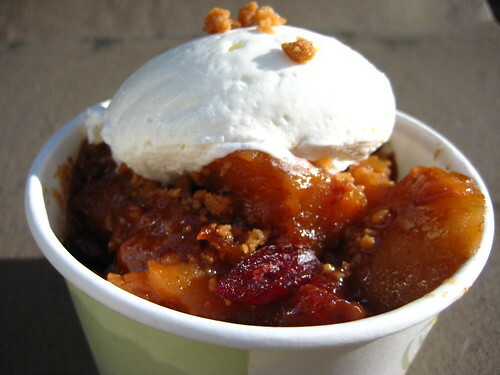 To break my Dessert Truck fast, I went with the slow baked apples; apple chunks smothered in a cinnamony syrup with dried cranberries and a little crumble, topped with real whip cream. It is delicious, the puff pastry is buttery and flaky, it's the perfect thing to stave off an apple pie craving.